It has been a while since I last reported on passive AM loop antennas…the smallish variety that are such a cost-effective way to perk up your AM radio reception on the cheap. If you haven’t tried one out you’re in for a treat! The good folks at Tecsun Australia just sent me their Tecsun AN-100 to check out and as usual I pitted it against the well-known Terk AM Advantage AM antenna and a few others I have on-hand, such as the excellent but no longer available Select-A-Tenna. The Tecsun AN-100 is also sold in other areas as the model AN-200 which appears identical in every respect except for the style of the plastic base…they can be found under the names Grundig and Kaito as well as Tecsun. All will function identically. 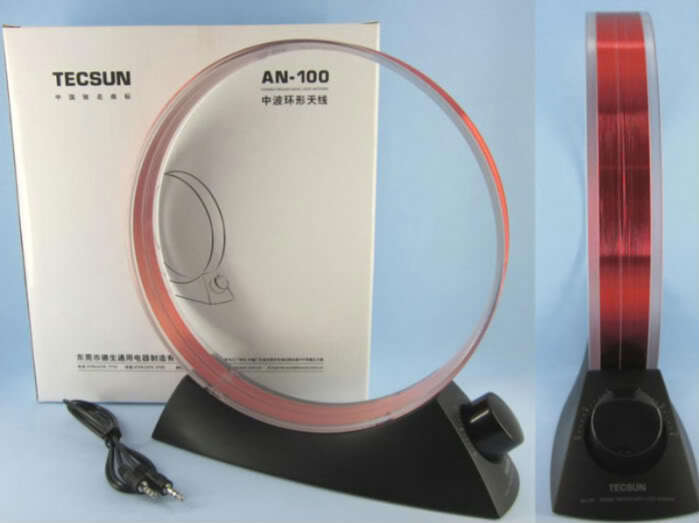 These Tecsun antennas are beautiful antennas…some might call them artful…. aesthetically pleasing and nicely designed and of good mechanical quality. Overview: Passive loop antennas are not a new invention – they’ve been around as long as radio has been. 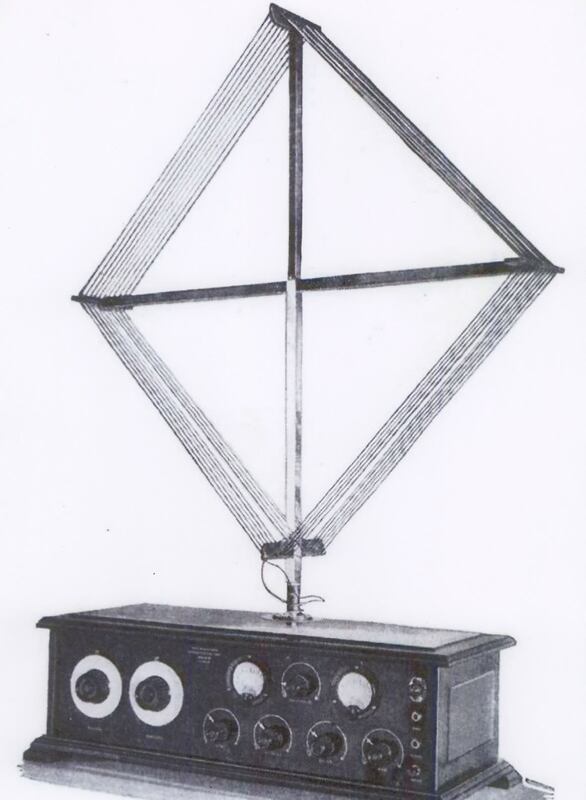 Long before highly efficient ferrite rod antennas were commonplace, early radios required either an outdoor wire antenna (called aerials in those days) or a loop antenna. 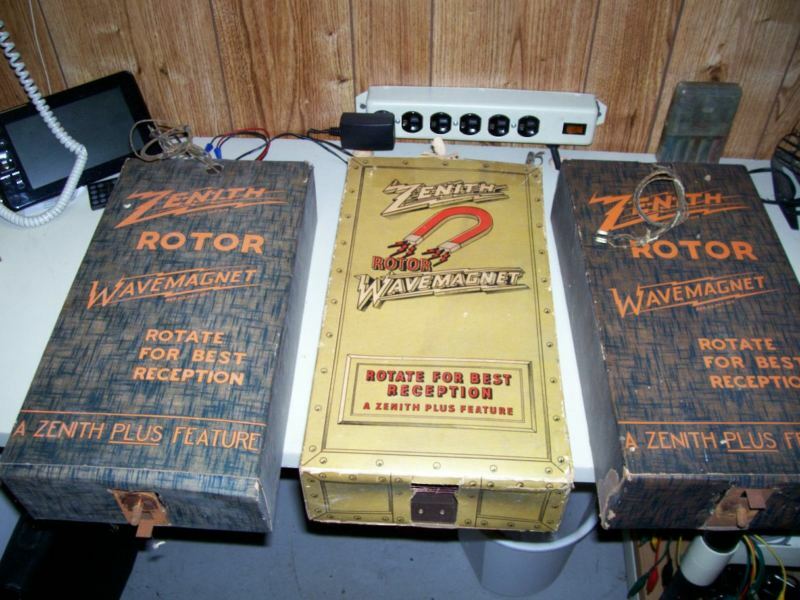 Some loops were ornate and sat atop the radio, others, like the Zenith boxed loops pictured further down on this page, were mounted inside the console cabinet and could be “aimed” – rotated by a front panel knob for best reception. 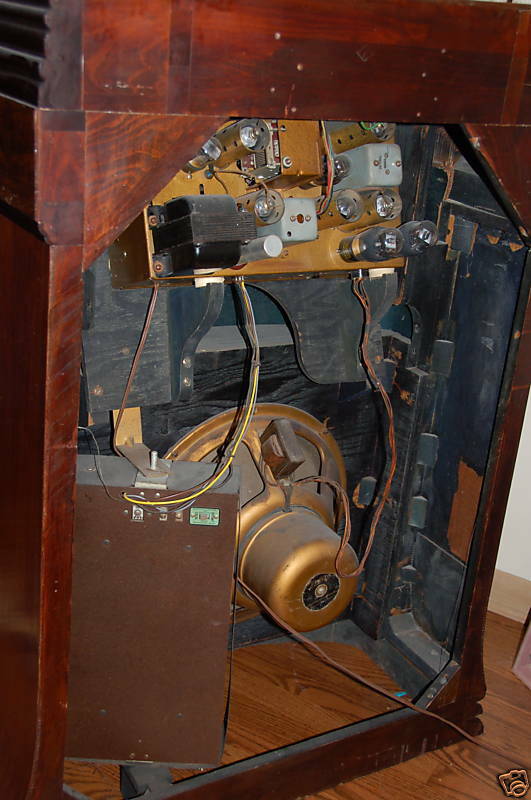 When smaller table radios appeared in the 50’s and 60’s they contained a loop of wire, usually wound on their back panel. Tuned vs Untuned: Loops can be designed either way and each has strengths and weaknesses. In common with both types is the ability to reduce RFI – Radio Frequency Interference. Loops respond to the magnetic portion of the RF signal and ignore the electrical component where most of the noise is. This is a prime benefit of all loops including the ferrite rods inside almost all portable AM radios which are, after all, simply loops made more efficient by their ferrite core. By comparison, wire or whip antennas tend to pickup more noise. Ferrite rods and loops are also directional which allows them to be aimed to maximize reception or minimize interference. The main advantage of an untuned design is that it doesn’t have to be re-adjusted for each frequency you tune your radio to. Untuned loops can be very effective if they are large enough to capture enough signal. Such loops can span entire bands or groups of bands effectively…the T2FD loop is one good example of an untuned loop . However, smaller untuned loops of the type that come with most of today’s typical table top radios or A/V receivers generally provide lackluster reception and are primarily a cheaper alternative to the superior ferrite rod… these loops work after a fashion as long as signals are strong enough. Tuned loops such as this Tecsun AN-100 on the other hand can provide extremely high gain without any electronic amplification in a small size. A tuned loop is designed according to a formula such that if there are the right number of wire turns of the correct shape and size, a variable capacitor connected to it will bring the loop into resonance throughout the AM band providing much more signal than if it were the same size but not tuned. You also get the added benefit of pre-selection because your loop will only be amplifying the specific frequency you are tuned to. Also such loops are very directional, so between the pre-selection and aim-ability you can often null an offending signal or noise while peaking the desired signal. How They Work: Assuming your portable or table radio has an internal ferrite rod antenna (most portables do…many table radios don’t) these tuned loops are generally best used via induction with no direct connection to the radio. This will really amaze you the first time you see it work. The loop receives the signal and through resonance amplifies it substantially, creating an intensified signal field around the antenna. Place the antenna adjacent to your portable radio and it radiates this stronger signal into the radio. Weak signals will sometimes literally jump out of the mud and come in almost like locals. But there is a technique to this and the easiest way to get the feel of one of these antennas for the first time is in the daytime when AM signals are generally weakest and most stable. Tune your AM radio to a weak station. Now place the loop antenna perpendicular to the radio and near the center of the back or to one side of it while slowly turning the antenna’s tuning knob. At some point you should hear a big increase in signal level…if your radio has a signal strength meter this will be even more obvious. Now you can move the antenna around the radio to find where the signal transfer is the strongest…that position relative to the radio will be best for all signals. Now as you tune around you should rotate the radio and antenna together and you will see how well a loop can work. 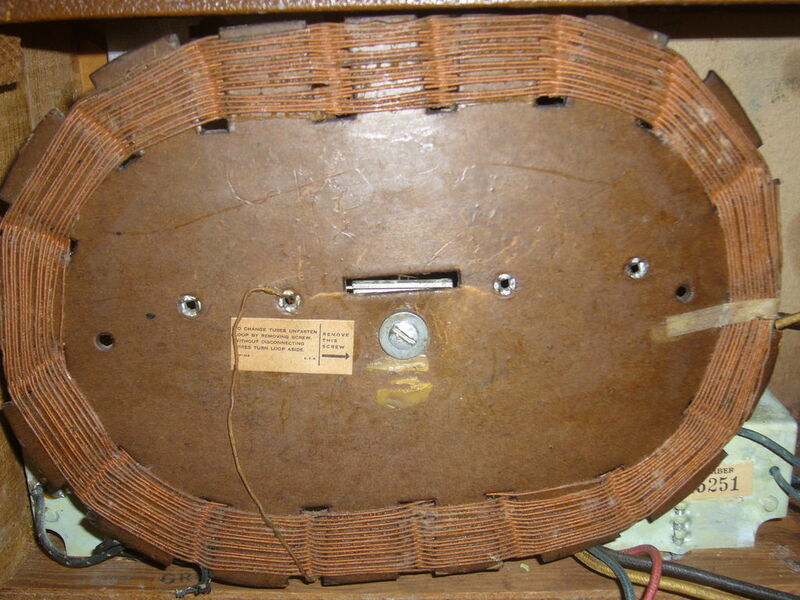 I like to use a Lazy Susan to aim the radio and antenna together…it gives a very deluxe feel to the process. Most such loops, including the Tecsun AN-100 also have an output jack that allows a direct connection when that is desired. A direct connection is necessary if the radio does not have a ferrite rod antenna inside it. If your radio has one of those small untuned loops just connect you’re AN-100 right across the existing antenna’s terminals – leaving the original antenna in place usually gives the best results. Experiment to see which way works best. Also if your radio has an auxiliary antenna jack that disconnects the radio’s built-in antenna, a direct connection may allow you to have more control over the signal in terms of tuning and nulling..again, experiment to see how well this works. Usually using induction with portable radios works the best giving the highest signal levels. Note: That output jack can also be used as an input jack! If you have an outdoor AM antenna you can connect it to this jack, then use the antenna as a pre-selector and to radiate the signal into a portable radio with results better than using a direct connection. Again, experiment to see how well it works for you. Caveats & Misconceptions: One of the frequent emails I receive is something like this; “I tried the antenna and can’t hear any difference”. There are several possible explanations for this. 1) The better the radio the less dramatic the difference usually is. I’ve often referred to these small passive loops as great equalizers; they bring mediocre radios up nearer to the reception of much more sensitive radios. But even the best radios can sometimes benefit from a loop – it’s just that the differences may be more subtle in many cases, especially at night. 2) If heavy noise/local interference is the limiting factor an indoor antenna may not help much. 3) If you are trying to receive a signal which is just not receivable in your location you can’t expect that a loop will make it happen. 4) It can be tricky to find the best antenna orientation relative to the radio at night which is why I recommend you try it first in the daytime. 5) Some modern radios just don’t like inductively coupled loops. In essence the presence of the loop detunes critical circuits in the radio and degrades performance. This is very rare but I have seen it a few times. What Can the AN-100 do? First, it will make lesser radios much more sensitive. If you have some weaker daytime signals one of these loops will usually make it louder and clearer. At night, even though most signals are stronger it can help minimize fading and make some problem signals sound better. Loops can also reduce noise and interference. My kitchen radio suffers from noise from a nearby light dimmer…placing a loop next to it reduces that buzz almost completely. A loop will also add pre-selection which might help if you are receiving interference from a station or noise source not on your desired station’s frequency. Even my best radios are often helped a bit by use of one of these antennas and I would not be without one. Comparing Loops: I’ve said it before and I’ll say it again – all same-sized passive loops should perform similarly – you can’t change the laws of physics. Only by increasing the capture area (size and amount of wire) can you get more signal out of a passive loop, which is why the larger MTM Scientific Loop provides a stronger signal than any of these smaller loops. Unfortunately such a large loop is often unwieldy in use as it requires lots of space and the MTM is a kit which must be assembled. That is why these smaller loops are so popular – they provide a good combination of small size, low cost and good performance. To prove this once again to myself I compared several loops….the Tecsun AN-100, Grundig AN-200, Terk AM Advantage and Select-A-Tenna Model M with a few radios and in all cases they were virtually indistinguishable from one another. You can therefore choose amongst them based on style, cost and availability. 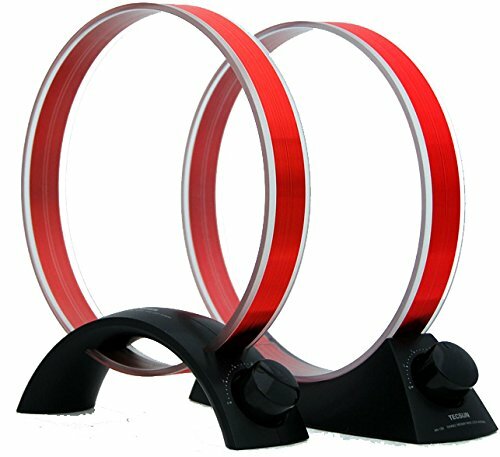 But whichever one you choose, a loop antenna will add a new dimension to your AM radio listening and in many cases will do more to improve your AM reception than upgrading to a slightly better radio.